New Canaan wide receiver Carson Armstrong hauls in a 55 yard touchdown pass during the annual Red & White football game in New Canaan, June 14th, 2013. NEW CANAAN -- Dunning Field marked the spot of New Canaan's first full-pad practice on Saturday afternoon, and with the start of the regular season less than a month away, these Rams sound like they're raring to go. "This week we've stepped it up. We're not there yet, but we're definitely getting there," running back and captain Michael Root said. "We have a few returning starters, but like our coaches say, there are no starters right now. We're all competing for jobs." Here are some pressing questions for the Rams. WILL NEW CANAAN STICK WITH A TWO-QUARTERBACK SYSTEM? : Nick Cascione and Teddy Bossidy split time in 2012, with Cascione attempting 185 passes compared to 110 by Bossidy, and the strategy seemed to pay dividends for Marinelli. Cascione threw for 1,133 yards and 16 touchdowns (89 QB rating), and Bossidy notched 748 yards and 9 touchdowns (95 QB rating). "I'm blessed because both of them could be starting quarterbacks for any team in the league. In the scrimmages we'll see who moves the team better and things like that and then make a decision," Marinelli said. "Whoever isn't the so-called starting quarterback will have other packages either at quarterback or at another position." WHO WILL REPLACE LOUIS HAGOPIAN, LAST YEAR'S LEADING RUSHER? : In actuality, Cascione led the team with 750 yards on 124 carries, but Hagopian set the pace from the running back position, carrying the ball 92 times for 415 yards and three scores. His departure leaves the ground game in the hands of the Rams' running back stable of Frank Cognetta (73 carries for 336 yards and 3 touchdowns), Morgan Carson (15 carries for 112 yards and 1 touchdown) and Root, who played exclusively on the defensive side of the ball last year, recording 105 tackles. Marinelli sees the offensive line, which may have a starting five of Ryan McKenna at center, James Keneally and Joao Rocha at guard and Beau Santero and Michael Donnelly at tackle, as a strength. 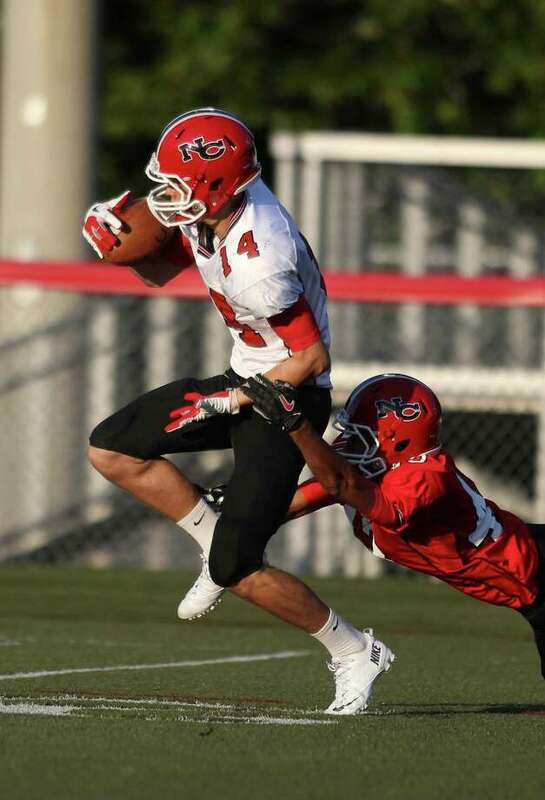 HOW WILL NEW CANAAN NAVIGATE A TOUGHER SCHEDULE? : Navigating through the FCIAC is certainly no easy business in any season, but the Rams will have even more hurdles to clear in 2013 than they did last year, facing the likes of Greenwich, Danbury and Staples. Additionally, New Canaan must start its season by taking a trip to play Daniel Hand, the two-time defending Class L champions who defeated the Rams in the 2011 title game. The Rams will also host Chicopee, Mass. "That's what we want; we want a tough schedule and we want to prove ourselves as a team," Root said. "The goals stay the same. We want to compete for the state championship, we want to win the FCIAC and we want to have the best season we can have." CAN THE DEFENSE BE EVEN BETTER? : All high schools are inevitably hit by graduation losses every season, but the New Canaan defense appears to have many key pieces still in place. After surrendering more than 16 points only five times last year, the Rams return five of the top six leading tacklers from last season: Cole Harris (143), Root (105), Zach Allen (76), Max Wilson (62) and Connor Buck (59). "We're going to need five of those guys who helped us last year," Marinelli said. "Our schedule is a lot different this year, but we're excited about who we can put on the field defensively." HOW DO THE RAMS REPLACE 23 DEPARTED SENIORS? : Regardless of how many players have come and gone over Marinelli's 33-year coaching tenure at New Canaan High, the Rams always seem to be right in the thick of things. "When you have this kind of roster, kids keep working hard, they keep moving up and they fit into slots and they take over," Marinelli said. "That's when you're reloading instead of rebuilding. Our seniors have done a great job dedicating themselves." And while losing 23 seniors may be devastating for some programs, the Rams seem to view it as something of a positive, noting how it opens the door for position battles and heightened competition. In addition to Rocha and Root, the other two captains are Buck and Harris. "We feel that competition is very healthy and that you do need some competition in order to get the best out of your players," Rocha said. "We do have some position battles at wide receiver, running back and we feel like that makes us a better team." Starting wide receiver positions are up for grabs as well, as the quintet of Jack Gilio, Cole Turpin, Seth Neeleman, Carson Armstrong and Robby Paul, among others, will vie for snaps. "There are a lot of possibilities," Marinelli said. "We're still kind of feeling our way right now."